Lifting plant and equipment can cause accidents if they are used unsafely or poorly maintained. 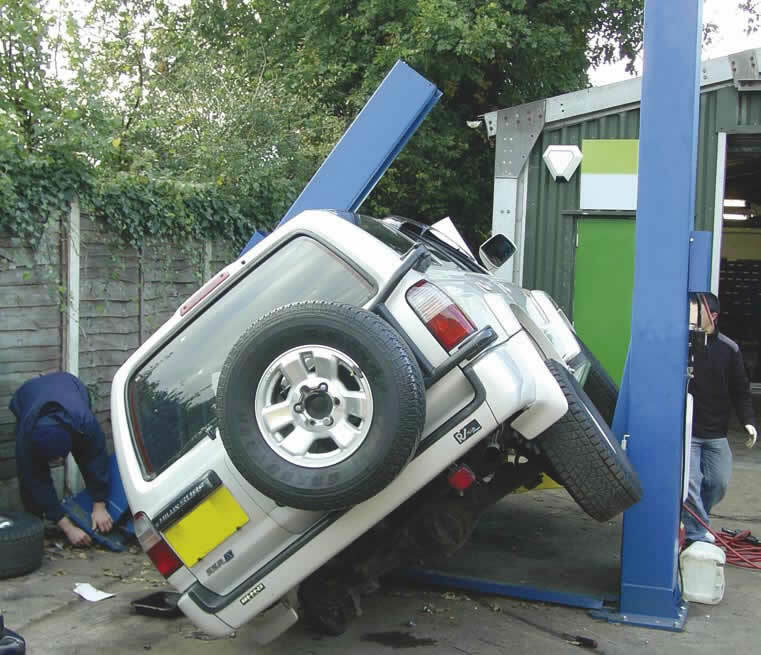 Vehicles falling/rolling off incorrectly positioned jacks or stands, particularly where they are not chocked, are one of the main causes of fatal accidents in MVR. 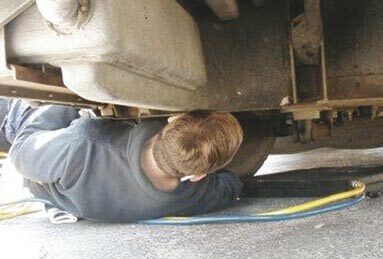 Working beneath a vehicle is often required to check for faults, servicing and repairs etc but because these tasks are so common people get used to working under potentially lethal weights. Unfortunately, serious and fatal accidents happen every year even though the dangers and precautions are well known. You must always use the right equipment for the job. Don't be tempted to take short cuts or use inappropriate equipment to lift heavy items. Make sure the floor and fixings meet the lift manufacturer's specification - if in doubt get specialist advice! 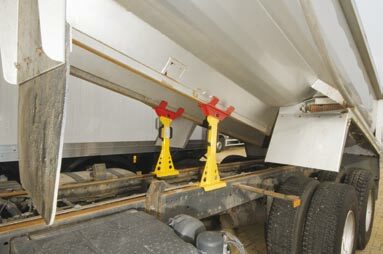 Additionally for two post lifts, ensure that the arm locks are fully engaged and secure and that all the lifting pads are positioned correctly before raising the vehicle to full height (see Defective locking devices identified on modern 2-post lifts and Risk of vehicles falling off two-post vehicle lifts in motor vehicle repair (MVR) for more information on two post lift safety). If there is no prop fitted or if one is fitted but you are unsure it will be effective, then provide your own additional support. Don't work beneath a vehicle with air suspension unless you prop it first. Never crawl beneath a vehicle fitted with air suspension unless it is properly supported. Don't try to adjust the ride height of air suspension for the purpose of recovery or repair. 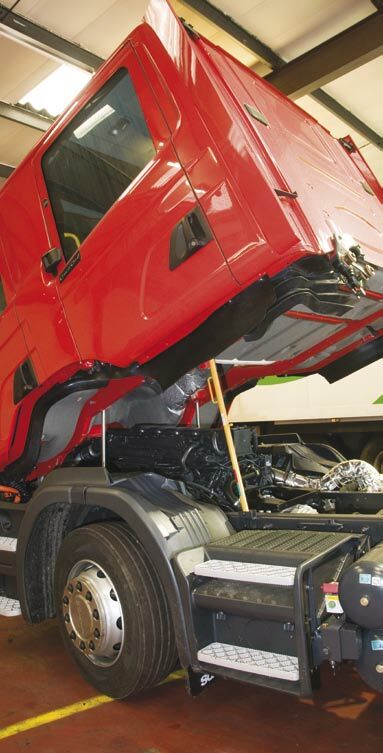 For more information on working under buses and coaches fitted with air suspension see Safe recovery (and repair) of buses and coaches fitted with air suspension. 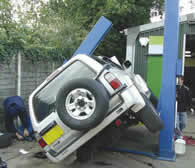 A mechanic was replacing a gearbox with a car raised on a hydraulic trolley jack and two wheel removal jacks. The car slipped from the supports, crushing and killing him. Two men were using a chain block suspended from a gantry to remove an engine from a vehicle. As one turned his back on the raised load, the other moved the gantry, which fell onto his colleagues head, killing him. They were not following a safe system of work. A car fell off a two post lift, killing the mechanic working below. The arms did not lock and the lifting pads were damaged or missing. A tyre fitter went to change six tyres on a school coach parked on a sloping car park. Both rear nearside wheels and one offside wheel had been removed and he was in the process of jacking it up when it fell onto his head and chest, killing him. A worker was standing at the end of a raised four post lift and pulled the car towards him. There were no end-stops on the lift and he was unable to stop the car falling off the lift onto him. He died in hospital from crush injuries. The lift had never been thoroughly examined and tested. An HGV recovery fitter was crushed to death under the air-lifted axle of a tractor unit he was attempting to rescue from the roadside. No supplementary supports were used.